Salem and Loki are 14 years and 7 years old. They are both a mixed breed. I rescued Salem (black) from an independent shelter while living in Montreal. Loki (white and black) was the only cat left in a litter that my friend had, from rescuing a feral pregnant cat and I took him in. Salem is a little older but still has the energy to pester his brother and show him that he's still boss. He loves trying to swat food off of people's plates too. Loki is a real joker, he loves to play and make people laugh. He is very curious and will explore anything new. Both are people lovers. Salem and Loki are so beautiful! They look very happy in the picture :) Just maxin' and relaxin'. I understand how hard it is right now for you with the passing of your dear Salem. You did your very best for him. Bless your Heart! Please take comfort in knowing that he had a long and happy life with you. I know how hard it is to lose a beloved fur baby. I had to have my own dear 19 year old Dirk PTS in June, his health had deteriorated so badly. 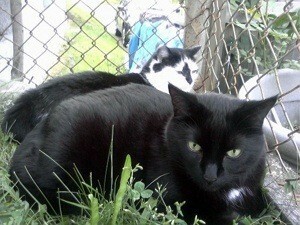 May your dear Salem rest in peace and may your heart heal. So sorry about Salem. He was a very beautiful cat and he was lucky to have such a loving home. Loki is a cutie I hope he is not too sad.